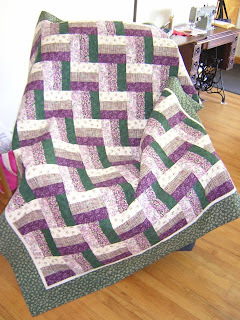 Some of you know I plan my quilts with EQ7. So, you must be wondering what I saw when I decided to go with the layout for Indy's quilt. The colors were similar but not the exact fabrics I had selected. It was not apparent that the orange was so intense and that the yellow would wash out. Maybe it was noticeable when I stacked them for a preview to determine the order to use in EQ, but seeing it on the screen was what sold the plan. Next time, I will try to use closer colors in EQ and consider my preview stack to be my most important factor for fabric selections. Traditionally, the Rail Fence quilt works best with darkest or most intense color fading to the lightest. The two block version I made for my mom is an example of the dark to light arrangement.